Are you on the quest for the holy grail skin foundation? Perfect eye shadow palette? Lipstick shade that really is the same color as your lips, but better? Like most people shopping for virtually anything that will be worn, you probably want to try that makeup on before purchasing it. Thankfully, if you’re shopping for cosmetics in most brick-and-mortar beauty stores, the world is your oyster for swatching, sampling, and trying on before you commit to a new gloss, fragrance, or even foundation. While trying before you buy has its advantages (no one likes that awkward feeling of returning something you’ve already used, right? ), it can also expose you to some unexpected additions: germs, and lots of them. 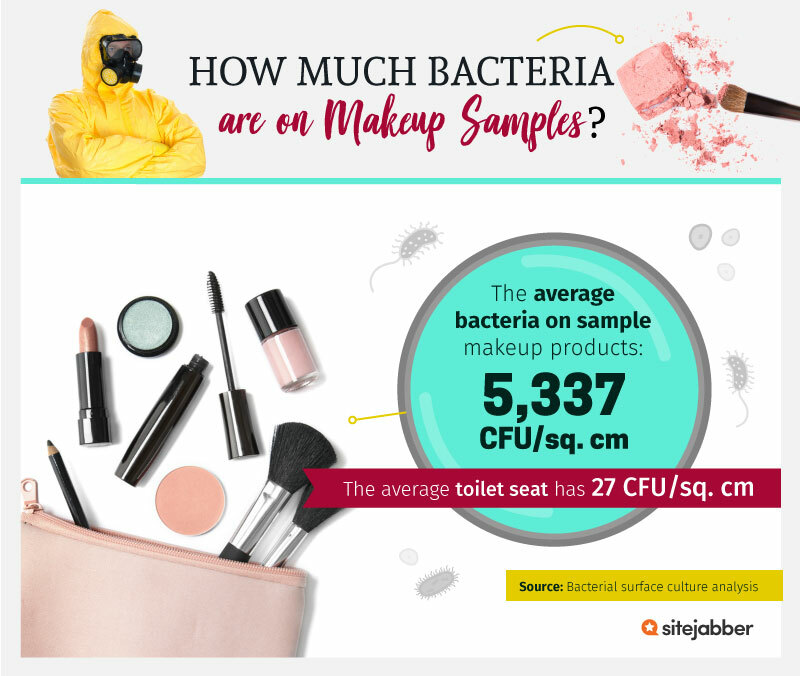 Before you pick up another sample product or tester wand, take a look at how much bacteria we found on various cosmetic products at three of the most famous makeup retailers across the country. 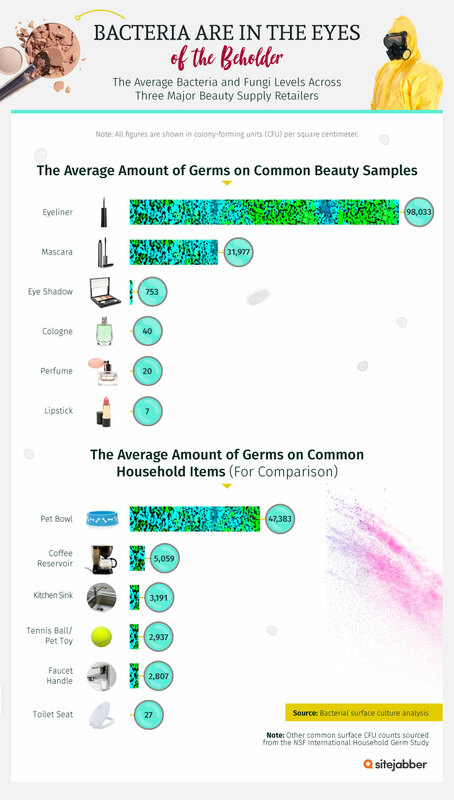 We’ll tell you which cosmetics might be the dirtiest and what types of bacteria (and the infections they can lead to) we found, and we’ll compare those samples to some common household hotbeds for dirt and germs. If you’ve ever wondered what might be dirtier – a toilet handle or sample eye shadow – keep reading to see what we uncovered. 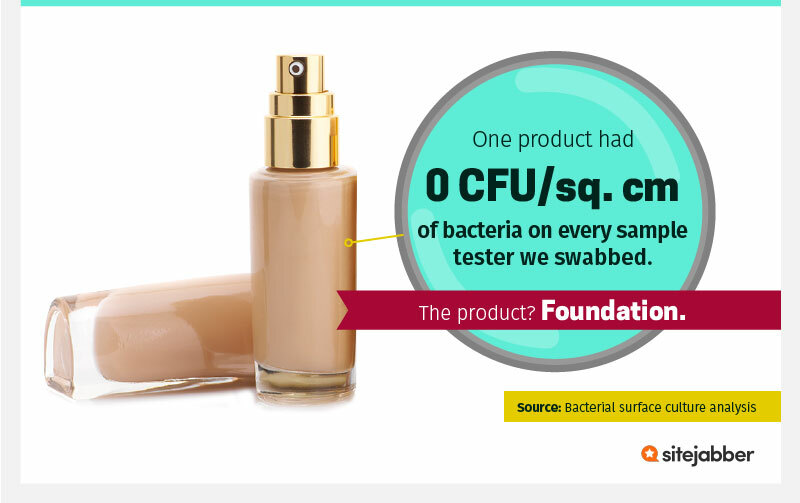 Of the 24 product swabs we tested, the average tester product found at various makeup retailers was inundated with over 5,000 colony-forming units (CFU) of bacteria per square centimeter. In case that doesn’t sound like the startling number it is, putting sample makeup on your face or body could actually be far worse than touching the average toilet seat and rubbing your eyes or mouth with that same hand. In contrast to the number of viable bacteria cells we found on beauty testers, the average toilet seat contains only 27 CFU/sq. cm of similar bacteria cells – the average beauty tester has almost 200 times the bacteria as the average toilet seat. You may have seen individual sample wands and tools at the beauty counter to help prevent these massive amounts of icky particles from spreading, but that doesn’t mean everyone passing through the store is using them or that they haven’t been contaminated too. While uncommon, experts admit you could even contract viral diseases like herpes from tester lipstick tubes if the product isn’t clean before you swipe it across your lips. So what does all of this bacteria mean to you, and which products really are the riskiest for testing or swatching? No matter how pretty the shades may look in the pan or how much you really want to see what they look like on your own eyelids, sample eyeliner was the dirtiest of all, which could mean serious danger for a very sensitive part of the body. At over 98,000 CFU/sq. cm. (more than three times the amount of bacteria we found on the next dirtiest product – mascara), tester eyeliner products should be approached with caution – they’re more than twice as bacteria-laden as the average pet bowl. The eyes are particularly prone to severe infections caused by bacteria, including pinkeye and keratitis, which can lead to swelling, pain, and discharge in and around the eyelid. Sample mascaras were found to be more than six times as dirty as an average coffee reservoir (5,059 CFU/sq. cm. ), and ten times as dirty as a kitchen sink, on average (3,191 CFU/sq. cm.). Considering you probably wouldn’t put a byproduct from any of those surfaces on or in your eyes, you might want to think twice before trying out that new eyeliner, mascara, or eye shadow palette before you buy. When it comes to these pesky pathogens, the truth is there are different types of bacteria and some can be worse for the body than others. In fact, while certain bacteria have been linked to serious infections including pneumonia and meningitis, others can actually be beneficial for the body. 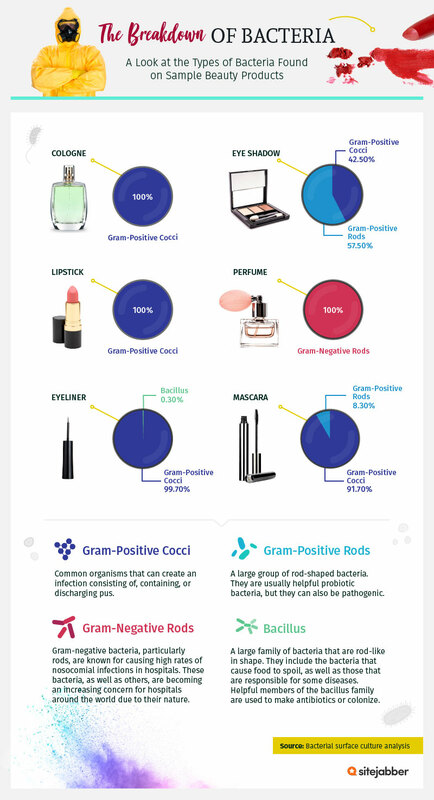 The various makeup samples we analyzed revealed four primary types of bacteria: gram-positive cocci, gram-positive rods, gram-negative rods, and baccilus. Don’t let the phrasing confuse you – the term “positive” doesn’t always denote a harmless microbe when bacteria are involved. Sample eye shadow products we swabbed ultimately produced among the highest germ count, but not all of those microbes were the same. Of the 753 CFU of bacteria found on the average eye shadow tester, nearly 58 percent were comprised of gram-positive rods. A helpful probiotic bacteria, gram-positive rods are generally harmless. Unfortunately, eye shadow samples weren’t entirely in the clear. The other 42 percent of bacteria we found were made up of gram-positive cocci, which can lead to serious skin infections, sepsis, and pneumonia. Like eye shadow, 100 percent of bacteria swabbed from lipsticks and sample colognes and nearly 100 percent of bacteria on eyeliner were made up of potentially dangerous gram-positive cocci. In contrast, we found sample perfume products covered in 100 percent gram-negative rods (also potentially harmful). In recent years, the beauty industry has ascended to a $445 billion trade. Considering the average woman spends roughly $15,000 over the course of her lifetime on makeup and skincare, it’s safe to say beauty retailers are seeing a fair amount of traffic testing out the latest duochrome highlighters or metallic lip glosses. Before you consider swiping or sampling these tester products on your own skin, you might want to consider where they’ve been before and what they might be crawling with. Tester eyeliner products studied at three of the most prominent beauty stores were covered in thousands of bacteria particles – some of which are downright dangerous. If you’re looking to skip the bacteria collections and get firsthand feedback on some of the products and services found at beauty brands like Sephora, MAC, or Lush, let Sitejabber be your guide. With thousands of businesses and millions of customer reviews, Sitejabber helps consumers narrow down the best companies to buy from by weeding out the rest. With answers to commonly asked questions, consumer feedback, and honest reviews, we’ll help take the guesswork out of online shopping. Start reading and writing your own reviews at Sitejabber.com today. We conducted 24 individual gram and stain culture swab tests across seven types of surfaces. The surface in question was the casing of sample makeup testers. Each type of surface was swabbed three times at three different major beauty supply retailers, with the exception of foundation, which was swabbed six times at six different major beauty supply retailers. Colony-forming units per square centimeter were averaged for each surface type. Individual surfaces were chosen based on perceived traffic and accessibility. It is possible that with a larger sample size of surfaces, we could have gained more insight into CFU levels. Foundation did not yield any results. No statistical testing was performed, so the claims listed above are based on means alone. As such, this content is exploratory. Instead of sharing germs, feel free to share this study. We permit you to use the images and content here for noncommercial purposes. Just don’t forget to link back to this page to give the authors proper credit.